Mangifera linnaei Korth. ex Hassk. Mangifera montana Heybe ex Wight & Arn. Mangifera sativa Roem. & Schult. Mangifera indica Bl. = Mangifera foetida Lour. Mangifera indica Wall. 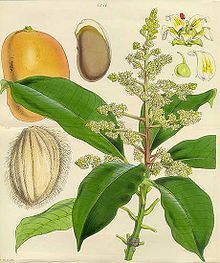 = Mangifera sylvatica Roxb. Linnaeus, C. 1753. Species Plantarum, Tomus I: 200. Hassler, M. 2018. Mangifera indica. World Plants: Synonymic Checklists of the Vascular Plants of the World (version Mar. 2018). In: Roskov Y., Abucay L., Orrell T., Nicolson D., Bailly N., Kirk P., Bourgoin T., DeWalt R.E., Decock W., De Wever A., Nieukerken E. van, Zarucchi J., Penev L., eds. 2018. Species 2000 & ITIS Catalogue of Life. Published on the internet. Accessed: 2018 Aug. 09.
International Plant Names Index. 2018. Mangifera indica. Published online. Accessed Aug. 09 2018. The Plant List 2013. Mangifera indica in The Plant List Version 1.1. Published on the internet. Accessed: 2018 Aug. 09. Tropicos.org 2018. Mangifera indica . Missouri Botanical Garden. Published on the internet. Accessed: 2018 Aug. 09. USDA, ARS, Germplasm Resources Information Network. Mangifera indica in the Germplasm Resources Information Network (GRIN), U.S. Department of Agriculture Agricultural Research Service. For more multimedia, look at Mangifera indica on Wikimedia Commons. This page was last edited on 25 February 2019, at 08:16.